phoenixNAP Review 2019: Is phoenixNAP a Good Hosting? 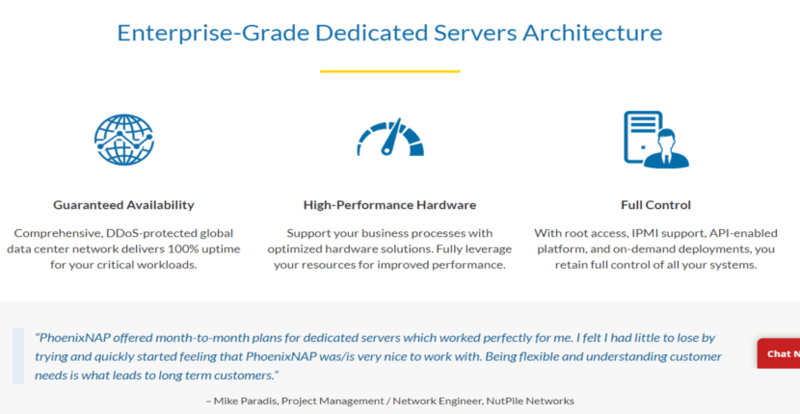 In business since 2009, phoenixNAP offers high-end hosting solutions on the cloud and dedicated servers, as well as colocation and bare metal services from their six data centers. Their services are a great option if your needs exceed what a traditional shared hosting server can provide. They use a flexible pricing model with some of the plans having an hourly option and others allowing you to pay only for what you need without any unnecessary extras. PhoenixNAP provides outstanding value with state-of-the-art technology through their cloud hosting, managed dedicated, dedicated servers, colocation, and bare metal solutions. In business since 2009, this American company has six data centers that span across North America, Europe, and Asia. The network is protected against Distributed Denial of Service (DDoS) attacks to keep you connected at all times. Also, they provide low latency 10 Gbps redundant connectivity with each host, giving you maximum availability that’s fast and reliable whenever your customers need to use your services. I particularly like their support for Software as a Service (SaaS). With the cloud or dedicated servers, SaaS organizations get enterprise-class performance with firewalls, VPNs, load balancers, and optimal network setup. Also, you can get VMware vApps if you wish to deploy templated groups of VMs. Plus, being that phoenixNAP is a PCI DSS v. 2.0 validated service provider, user data and payment card information on your platform is protected. They also made the dedicated servers easy to use with their custom control panel – PNCP. On this, you can manage your resources, configure DNS, manage user roles, view and handle billing, and upgrade RAM and CPU resources at any time. So, if you run a gaming, video-on-demand, multimedia, or graphics application, or other data-hungry and high traffic projects, you’ll appreciate not only the control panel, but also the high level of security and fast industry-leading storage that comes with SSD/NVMe (PCIe SSD). PhoenixNAP specializes in providing high-end hosting solutions; their prices are expected for their premium high-quality services. Although they don’t offer refunds, they do provide a flexible pricing model. On the dedicated servers, you can pay only for what you need. As that need increases, you can choose to buy just the additional parts you require. The cloud services have a better pricing model. Not only are they flexible, but some plans also allow you to pay per hour or pay as you go. This is great for reducing costs. You can also pay month-to-month if you prefer. Their 24/7/365 customer support is accessible via email, live chat, and two numbers; one is toll-free, and the other isn’t. They have a promise backed by SLA to respond to email queries within twenty minutes to an hour depending on the plan you’re on. The conversations I had with the support team provided relevant insight that showed professionalism and knowledge on their part, rather than canned responses. Alternatively, you can use the knowledge base, which has a few tutorials as well. If you’re looking for high-end hosting, you can’t go wrong with phoenixNAP. Their cloud services, dedicated servers, colocation, and bare metal solutions come with quality and performance that deliver a smooth experience. However, small businesses and bloggers looking for a simple website will have to look elsewhere. Check out phoenixNAP’s web hosting options today! Wondering how phoenixNAP stacks up against other Web Hosting companies? Enter any other Web Hosting company and we will give you a side-by-side comparison.